What the heck is a space opera? I'm not sure where I first heard these books called "space operas," but I love the term. Like soap operas, space operas feature high drama, action, and even some romance, but they are set entirely or almost-entirely in outer space. 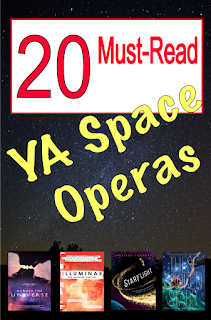 No matter what we call them, space operas are incredibly popular with my sci-fi readers, who constantly seek more, more, more! This is the first book in a trilogy that also has several spin-offs. Seventeen-year-old Amy joins her parents as frozen cargo aboard the vast spaceship Godspeed and expects to awaken on a new planet, three hundred years in the future. Never could she have known that her frozen slumber would come to an end fifty years too soon and that she would be thrust into the brave new world of a spaceship that lives by its own rules. Starbound, book 1. This book continues to be among my favorites in our library! Luxury spaceliner Icarus suddenly plummets from hyperspace into the nearest planet. Lilac LaRoux and Tarver Merendsen survive – alone. Lilac is the daughter of the richest man in the universe. Tarver comes from nothing, a cynical war hero. Both journey across the eerie deserted terrain for help. Everything changes when they uncover the truth. The Illuminae Files, book 1. The second book in this series, Gemina, just came out last month. This series is especially popular with boys and is told entirely through documents, instant messages, faxes, blueprints, and drawings. Very cool! This morning, Kady thought breaking up with Ezra was the hardest thing she’d have to do. This afternoon, her planet was invaded. Add in some menacing spaceships, a horrible virus, and a tiny bit of romance, and you've got a sure-fire hit for high schoolers. Andrew "Ender" Wiggin thinks he is playing computer simulated war games; he is, in fact, engaged in something far more desperate. The result of genetic experimentation, Ender may be the military genius Earth desperately needs in a war against an alien enemy seeking to destroy all human life. Looking for something terrifying? This book scared the ! @#$ out of me, not an easy feat. Three teens from Japan, Norway, and France get the opportunity of a lifetime when they are selected from a world-wide lottery to travel on the first manned space mission to the moon in decades. Little do they know that something sinister is waiting for them on the desolate surface of the moon. And in the black vacuum of space...no one is coming to save them. Chaos Walking, book 1. This is one of my favorite trilogies of all time. I love it so much that I talked about it on Modern Mrs. Darcy's "What Should I Read Next?" podcast last month. Set on a distant, newly-colonized planet, 13-year old Todd deals with being able to hear everyone else's thoughts and with the introduction of something he thought didn't exist anymore: a girl. Red Rising, book 1. Darrow is a Red, a member of the lowest caste in the color-coded society of the future. Like his fellow Reds, he works all day, believing that he and his people are making the surface of Mars livable for future generations. Yet he spends his life willingly, knowing that his blood and sweat will one day result in a better world for his children. But Darrow and his kind have been betrayed. Soon he discovers that humanity already reached the surface generations ago. Vast cities and sprawling parks spread across the planet. Darrow—and Reds like him—are nothing more than slaves to a decadent ruling class. This is a sci-fi "Snow White" that will appeal to fans of Meyer's Cinder. Essie has grown used to being cold. Temperatures on the planet Thanda are always sub-zero, and she fills her days with coding and repairs for the seven loyal drones that run the local mines. When a mysterious young man named Dane crash-lands near her home, Essie agrees to help the pilot repair his ship. But soon she realizes that Dane’s arrival was far from accidental, and she’s pulled into the heart of a war she’s risked everything to avoid. Starflight, book 1. This book was one of my favorites of 2016, and I look forward to reading the sequel, Starfall, which is scheduled for publication in February 2017. Salvage, book 1. Ava, a teenage girl living aboard the male-dominated, conservative deep space merchant ship Parastrata, faces betrayal, banishment, and death. Taking her fate into her own hands, she flees to the Gyre, a floating continent of garbage and scrap in the Pacific Ocean. A ragtag group of teenage mercenaries who crew the spaceship Avalon stumble upon a conspiracy that could threaten the entire galaxy. Starglass, book 1. Terra has never known anything but life aboard the Asherah, a city-within-a-spaceship that left Earth five hundred years ago in search of refuge. At sixteen, working a job that doesn't interest her, and living with a grieving father who only notices her when he's yelling, Terra is sure that there has to be more to life than what she's got. Sky Chasers, book 1. Fifteen-year-old Waverly is part of the first generation to be successfully conceived in deep space; she was born on the Empyrean, and the large farming vessel is all she knows. Her concerns are those of any teenager—until Kieran Alden proposes to her. The handsome captain-to-be has everything Waverly could ever want in a husband, and with the pressure to start having children, everyone is sure he's the best choice. Except for Waverly, who wants more from life than marriage—and is secretly intrigued by the shy, darkly brilliant Seth. Railhead, book 1. Zen Starling is a petty thief, a street urchin from Thunder City. Galahad, book 1. When the tail of the comet Bhaktul flicks through the Earth’s atmosphere, deadly particles are left in its wake. Suddenly, mankind is confronted with a virus that devastates the adult population. Only those under the age of eighteen seem to be immune. Desperate to save humanity, a renowned scientist proposes a bold plan: to create a ship that will carry a crew of 251 teenagers to a home in a distant solar system. Two years later, the Galahad and its crew—none over the age of sixteen—is launched. Though they have the same author and similar front covers, Spinning Starlight is NOT a sequel to Stitching Snow. It is a completely separate story. Sixteen-year-old heiress and paparazzi darling Liddi Jantzen hates the spotlight. But as the only daughter in the most powerful tech family in the galaxy, it’s hard to escape it. So when a group of men shows up at her house uninvited, she assumes it’s just the usual media-grubs. That is, until shots are fired. Liddi escapes, only to be pulled into an interplanetary conspiracy more complex than she ever could have imagined. Nebula Trilogy, book 1. Ree Lindbergh’s dream since she was a little girl is a simple one: to one day travel to Earth. Instead, she’s stuck aboard the Omega Centauri, a spacecraft used to patrol the borders of the Milky Way. Having spent her entire seventeen-year existence on board, Ree is a bit restless. But her mission is important: help keep Earth’s newly discovered alien species, the Bufoanthroid, under control. By day, Ree enjoys spending time with her best friend, Zac Walker. But when night falls, she is continually tormented by memories of her mother, killed by a Bufoanthroid the day Ree was born.